Hall Piano Music Academy's 2015 Summer Camp includes a series of 4 camps with age-graded development opportunities for children from 6-17 with at least one year of experience in piano lessons. Is it possible to mix fun and education this summer? Parents and grandparents may discover this great combination at Hall Piano Music Academy’s 2015 Summer Camps. The series of 4 camps offer age-graded development opportunities for children from 6-17 with at least one year of experience in piano lessons. The cost per student is $150 per camp. The “Summer Fun Piano Camp” will run June 1st - 5th from 9:00-11:30am. This module is perfect for ages 6 – 9 years and will include music storytelling, ensemble playing and performances, musical games and activities, theory, ear training, and more. This camp will be led by Kaitlyn Tholen and Andrew Fath. The “Summer Songwriting Workshop” will also run June 1st - 5th from 12:30-3:00pm. Designed for ages 12 – 17 and led by Ainsley Matich, this module offers hands on assistance with harmonization, notation, lyrics, and accompanying oneself on the piano. Also included are workshops with several local songwriters and a performance at the end of the 5 day session. 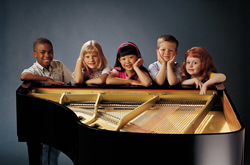 The second “Summer Fun Piano Camp” will run June 8th - 12th from 9:00–11:30am. Led by Leah Mulholland and Emily Fransen (Hall Piano Music Academy Director), programming is designed for ages 10 – 13, and includes theory and ear training, performance classes, sight reading workshops, duets and ensemble practice, one-on-one lessons with Academy staff on harmonization, memorization techniques, performance practices, and more. The final “Summer Fun Piano Camp” offered June 15th-19th from 9:00-11:30am is designed for students age 14 – 17 years. This camp will be led by Stefan Bernhard and Peggy Fransen, and will include theory and ear training, performance classes, sight reading workshops, duets and ensemble practice, music history, one-on-one lessons with staff on harmonization, memorization techniques, performance practices, and more. Located at 901 David Drive in Metairie, Hall Piano Company is south Louisiana’s premier Steinway & Sons dealer. In addition to piano lessons, Hall Piano’s services include piano sales and rentals, acoustic and digital piano sales, and method books. Adult lessons are also available. For additional information about the Hall Piano Academy’s Summer Camps, contact Emily McWilliams at emilym(at)hallpiano(dot)com or call 504.733.TUNE.